Mother’s Day is tomorrow. Are you ready? This cake can be made ahead with much success and is way better than burnt toast on mom’s special day, especially if it is served with good coffee. 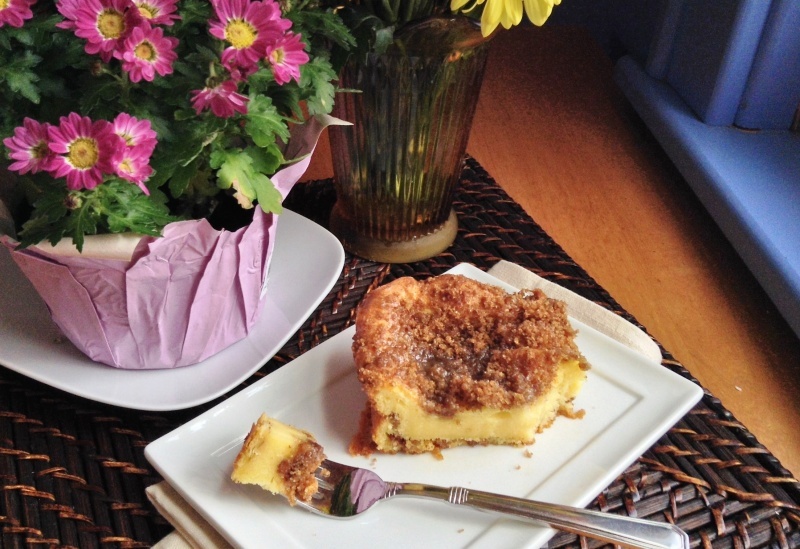 This streusel coffee cake is often referred to as Honey Bun Cake because of the extra layer of icing spooned over the top of the warm cake. I found several versions of it online while searching for something easy and tasty to make for a school potluck. And by easy I mean from a boxed mix only better. I am not a huge fan of cake mixes but our schedule lately has been crazed and I knew I would be baking after 9PM so this recipe fit the bill. I have made it several times and it is very tender and sweet with ample cinnamon crunch. Preheat oven to 350º F. Grease and flour a 9×13-inch baking pan. Combine the brown sugar and cinnamon in a bowl and set aside. Use an electric mixture to combine cake mix, sour cream, eggs, and oil. Beat until all ingredients are evenly blended. Spread 1/2 of the mixture into the prepared pan. Sprinkle half of the cinnamon mixture over the cake batter. Spoon the remaining batter over the cinnamon mixture and spread it into an even layer. It is OK if the cinnamon mixture spreads into the batter. Sprinkle the remaining cinnamon mixture over the top of the batter. Bake for 30 – 35 minutes or until a cake tester comes out clean. While the cake is baking, make your frosting. Combine powdered sugar, milk, and vanilla. Blend until lumps are gone. After taking the cake out of the oven, drizzle the icing over the top of the cake. Serve cake warm or at room temperature.